Battlefield: Bad Company 2 Vietnam digital expansion pack takes all of the intensity, action and addictive gameplay of Battlefield: Bad Company 2 and ups the ante with 15 classic Vietnam-era weapons and six vehicles. The expansion pack introduces five distinct and brand new multiplayer maps based on the Vietnam War. Each map brings a new gameplay experience with elements such as foxholes, tunnels and dense jungles from where the enemy can launch surprise attacks. All four multiplayer game modes from Battlefield: Bad Company 2, including the genre-defining Conquest Mode, will also be playable in Battlefield: Bad Company 2 Vietnam. The expansion is integrated with the full game persistence, so no matter what theater of war players are in, they will continue to level up. 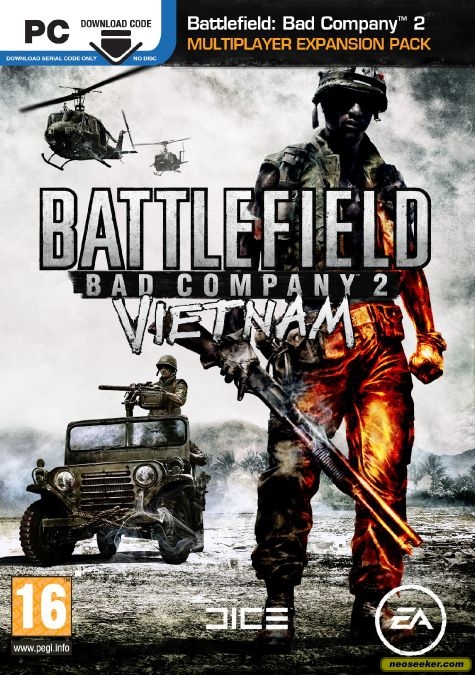 To promote Battlefield: Bad Company 2 Vietnam and grow its popularity (top games), use the embed code provided on your homepage, blog, forums and elsewhere you desire. Or try our widget. This is alright but not the greatest add-on. My opinion though, plenty of people love it. Great expansion pack with cool new content, including music, Vietnam era weapons and vehicles. Which of the 4 maps in Grind mode do you think is the biggest meatgrinder?